For those of you who have actual experience running distillations on both CBD and THC, what differences in the details have you noticed in how they run? I am hoping to learn if there is a difference on temps run with one compound versus another or any other parameter that needs to be adjusted with CBD vs. THC. I am not asking if the two can be separated by distillation, just if there is any difference. I recently was presented a logic problem and it involves CBD and also THC. The goal is to find any sort of deviation from one to the next that could then be leveraged but I have no expertise in CBD refinement per se but do know several techniques to otherwise refine compounds rich in THC. Any differences between the two would seem a logical lead to pursue as the start point. I realize it is tough to separate the two from each other but I suspect there is an answer not all that far away. It seemed tough at first to figure out how to isolate just THC alone but once understood it seems pretty easy now so long as attention to small detail is observed. I am one of those who has done both. In general, CBD distills at slightly higher temps and these can run a wide range depending upon the quality of the crude. I’m a toll processor for distillation which is not unlike working in a sausage factory. I see wide variations in crude quality in the hemp markets and this can have a definite impact on your distillation. If you control your source material then you’ll have a much easier go of it. That being said, here’s how that variation in crude quality can affect your distillation run. Decarbed vs. Non-Decarbed - If I recall correctly you’re running a short path setup but feel free to correct me if I’m wrong there. That being said, the hemp markets offer both decarbed and non-decarbed crude oil with non-decarbed selling at lower price points than decarbed. If you’re running an SPD you can of course decarb during your volatiles distillation. 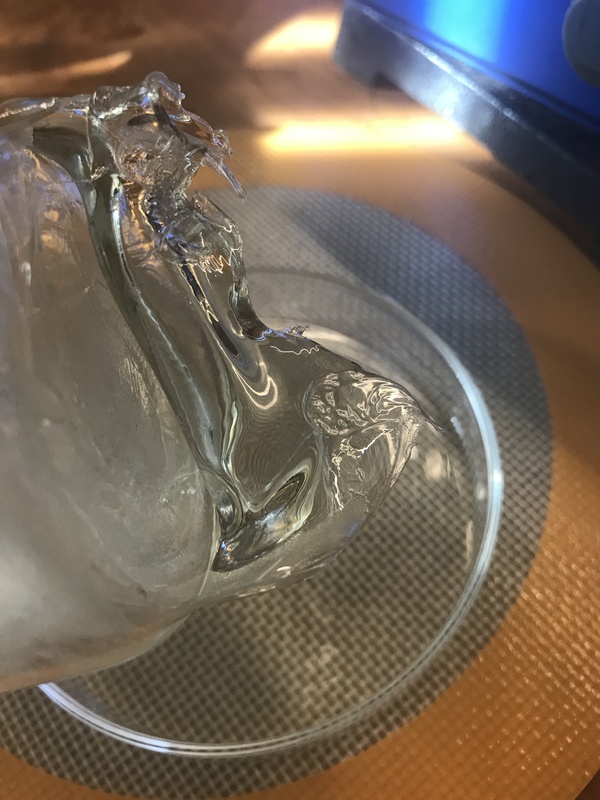 However, this makes your run take quite a bit longer and you’ll not be able to run as much in a batch due to the headspace required to allow for the foam up during decarbing. You will find it slower due to this because you can’t walk your vacuum down as quickly. On the other hand, you can decarb in a vacuum oven but that takes a bit longer. Extracting, Scrubbing & Filtering - There are still quite a few folks learning how to make good crude despite there being tried and true methods detailed here on Future4200 and elsewhere in the community. There are plenty of folks choosing to not cryo-chill their ethanol and are running at room temps or higher. There are also folks who use unconventional means of extraction that pull other plant materials beyond the trichomes. Both of these situations result in a significant amount tar left over in your pot flask if they don’t take the extra time to do the necessary filtering and scrubbing on this substandard crude. The net result for you as a distiller is that you get reduced yields, higher temps needed to wrestle the CBD from the tar (they act somewhat like a azetrope) and a redder distillate due to all of the above. Needless to say your cleaning time after a run goes up significantly as well. You may also have to change your vacuum pump oil more often due to the smoke that comes off of that tar during distillation. It will look like vapor but it doesn’t condense on the coil nor gets caught in the cold trap. It goes straight to your pump. Bad juju. I hope this helps. Not sure if it was what you were looking for though. 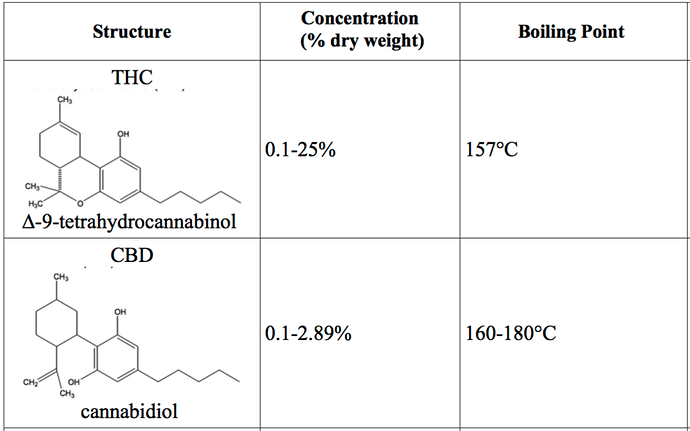 Regarding separation of THC and CBD during distillation…nope. You’ll need chromatography for that or convert the THC to CBN as detailed in a couple of different threads here. There isn’t enough of a temperature difference between the two to do it with distillation. Thank you for an in depth response. Very helpful. I want to try for some separation of the two through a plan perculating in my head. It will take several steps. This information suggests that the boiling points between THC and CBD are nearly identical but not the same. I should be able to determine during pass #2 if any separation at all, however slight, is possible. My plan then is to prepare a compound of CBD mixed with < 10% THC for running and use my high purity protocol which starts really at 126°C when the pressure is held under a few microns. I will very easily be able to determine if the two are mixed or if it is possible to coax out the ThC as the first fraction and then CBD enriched compound in the rest. For preparing I plan a modified LLE for this and currently the plan is also to run the procedure that removes chlorophyl along with plant waxes. After two or three passes through the sublimator I will have a good idea how to proceed with this as a test. Chromatography is likely part of this endeavor as well but this procedure is for data gathering. With luck the pressure swing will reveal the nature of any azeotrope formed but I am not entirely certain that under MFP conditions that the term azeotrope is even relevant? Azeotrope is a term used to describe boiling characteristics of two substances when boiled together. However with no effective pressure inside the system (MFP) is the term “boiling point” even a relavent term? This should be an interesting experiment. I wouldn’t expect to see much happen at 126C though. I typically distill at less than .10mmHg and see cannabinoids come over starting around 157C with CBD at 160-180 again depending upon the tar content in the flask. Keys to the city though…now that would be fun! 126°C is a high purity protocol I have developed. These pictures show this exact arrangement but of course without preparatory steps shown This is D9 THC isolate that I routinely refine. Note that the yellow jacketted meter is the oil temp here as measured outside the glass at oil temp level between the glass and heating mantle. When I peel the THC layer off if there are any contaminates or my hopes if there is any significant CBD then by peeling a layer up but intact it should reveal just how the cannabinoids came up to the cold finger. This following shot from this months refinement shows what I mean by peeling up the cannabinoids. 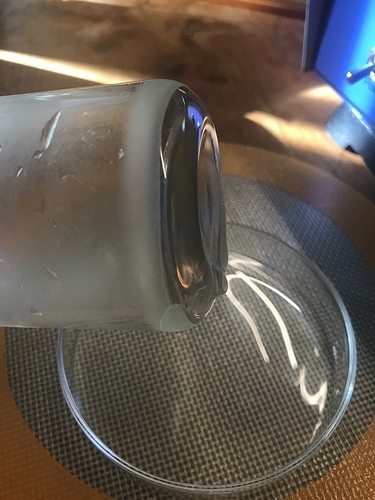 Much over 126°C and I start to see issues with color and clarity but if careful adjustments to temp are made this is the target temp for all my high purity runs. For a first pass the oil is thpically held at 150°C or so to pull it up past the tar. 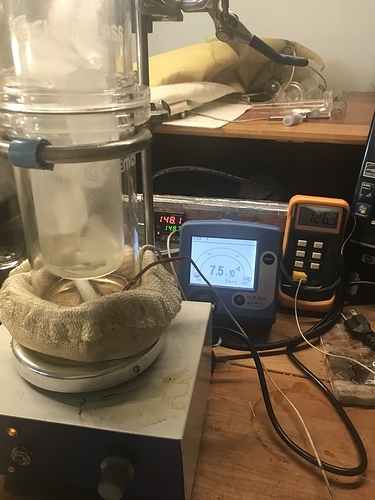 What sets my sublimator apart from standard SPD is that the head temp and boiling flask temp are one and the same so no extra heat is sacrificed or needed to run. My vertical SDP I have runs much hotter of course because it needs extra heat to function by keeping the uptake path heated. The sublimator has no glass uptake path. I have found that from the same crude provider, using really high quality crude, 65% and above cannabinoid content, that generally CBD comes over 10-15C lower than THC. @nomadgt You might be experiencing higher boiling points because generally hemp biomass and hemp crude isn’t treated as well as medical/recreational cannabis biomass or crude, and you generally have more compounds at similar boiling points that will increase your overall boiling points. 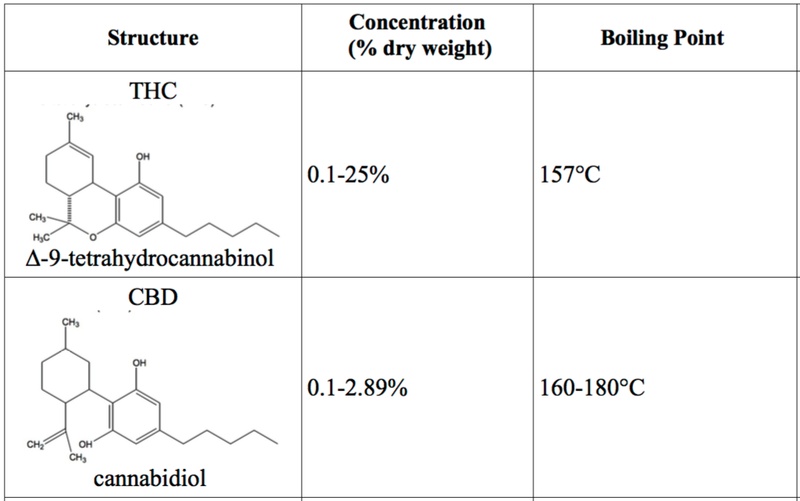 But equally refine crude, CBD boils lower than THC. Interesting and indeed there is more residue in the hemp crude I see vs. the CO2 crude I made on the THC side of the business. That being said, I do process some decent hemp crude with roughly a 65% yield on a regular basis. It all runs above 160C though. I stand corrected, THC does techically have a lower boiling point. However, high purity THC distillate does have a higher viscosity at room temp than CBD. CBD pours much easier. And I can always get the CBD main body to pop at a lower temp on the mantle than THC when working with good clean crude. Yep agreed, much less heat gun needed for CBD when I’m emptying out my receivers. Wondering, how did you put together your modified LLE? So you’re seeing CBD boil first rather than THC at a few microns? Also you’re saying your boiling points are 126c at that low of a pressure? I’ve seen much lower boiling points. Any idea why your boiling point seems to be higher? There’s a forensic paper that gives some good Psat data for independent compounds. Never found a VLE unfortunately. Been working on some group contribution estimations in a simulation software. Any success with putting together a usable VLE? I mis spoke if I asserted CBD boils at a lower point than THC. My rig pulls THC at 126°C and one micron to maybe six microns or so. This will of course change according to system enthalpy. There are a few factors that could impact this but in my rig the only other thing really that could add to total system energy is a stir bar and/or the way the extract is spun around.